In the 12th century, waves of Bantu-speaking immigrants arrived during the Bantu expansion. Among them, the Tonga people (also called Ba-Tonga, “Ba-” meaning “men”) were the first to settle in Zambia and are believed to have come from the east near the “big sea”. The Nkoya people also arrived early in the expansion, coming from the Luba–Lunda kingdoms in the southern parts of the modern Democratic Republic of the Congo and northern Angola, followed by a much larger influx, especially between the late 12th and early 13th centuries. Other European visitors followed in the 19th century. The most prominent of these was David Livingstone, who had a vision of ending the slave trade through the “3 Cs”: Christianity, Commerce and Civilization. He was the first European to see the magnificent waterfalls on the Zambezi River in 1855, naming them the Victoria Falls after Queen Victoria. He described them thus: “Scenes so lovely must have been gazed upon by angels in their flight”. Locally the falls are known as “Mosi-o-Tunya” or “thundering smoke” in the Lozi or Kololo dialect. The town of Livingstone, near the Falls, is named after him. Highly publicised accounts of his journeys motivated a wave of European visitors, missionaries and traders after his death in 1873. In 1888, the British South Africa Company (BSA Company), led by Cecil Rhodes, obtained mineral rights from the Litunga of the Lozi people, the Paramount Chief of the Lozi (Ba-rotse) for the area which later became Barotziland-North-Western Rhodesia. To the east, in December 1897 a group of the Angoni or Ngoni (originally from Zululand) rebelled under Tsinco, son of King Mpezeni, but the rebellion was put down, and Mpezeni accepted the Pax Britannica. That part of the country then came to be known as North-Eastern Rhodesia. In 1895, Rhodes asked his American scout Frederick Russell Burnham to look for minerals and ways to improve river navigation in the region, and it was during this trek that Burnham discovered major copper deposits along the Kafue River. North-Eastern Rhodesia and Barotziland-North-Western Rhodesia were administered as separate units until 1911 when they were merged to form Northern Rhodesia, a British protectorate. In 1923, the BSA Company ceded control of Northern Rhodesia to the British Government after the government decided not to renew the Company’s charter. 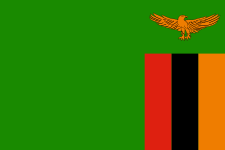 In 1953, the creation of the Federation of Rhodesia and Nyasaland grouped together Northern Rhodesia, Southern Rhodesia and Nyasaland (now Malawi) as a single semi-autonomous region. This was undertaken despite opposition from a sizeable minority of the population, who demonstrated against it in 1960–61. Northern Rhodesia was the centre of much of the turmoil and crisis characterising the federation in its last years. Initially, Harry Nkumbula’s African National Congress (ANC) led the campaign, which Kenneth Kaunda’s United National Independence Party (UNIP) subsequently took up. A two-stage election held in October and December 1962 resulted in an African majority in the legislative council and an uneasy coalition between the two African nationalist parties. The council passed resolutions calling for Northern Rhodesia’s secession from the federation and demanding full internal self-government under a new constitution and a new National Assembly based on a broader, more democratic franchise. The federation was dissolved on 31 December 1963, and in January 1964, Kaunda won the only election for Prime Minister of Northern Rhodesia. The Colonial Governor, Sir Evelyn Hone, was very close to Kaunda and urged him to stand for the post. Soon after, there was an uprising in the north of the country known as the Lumpa Uprising led by Alice Lenshina – Kaunda’s first internal conflict as leader of the nation. Kaunda’s endorsement of Patriotic Front guerrillas conducting raids into neighbouring (Southern) Rhodesia resulted in political tension and a militarisation of the border, leading to its closure in 1973. The Kariba hydroelectric station on the Zambezi River provided sufficient capacity to satisfy the country’s requirements for electricity, despite Rhodesian management. A railway (TAZARA – Tanzania Zambia Railways) to the Tanzanian port of Dar es Salaam, completed in 1975 with Chinese assistance, reduced Zambian dependence on railway lines south to South Africa and west through an increasingly troubled Portuguese Angola. Until the completion of the railway, Zambia’s major artery for imports and the critical export of copper was along the TanZam Road, running from Zambia to the port cities in Tanzania. The Tazama oil pipeline was also built from Dar es Salaam to Ndola in Zambia. By the late 1970s, Mozambique and Angola had attained independence from Portugal. Rhodesia’s predominantly white government, which issued a Unilateral Declaration of Independence in 1965, accepted majority rule under the Lancaster House Agreement in 1979. Civil strife in both Portuguese colonies and a mounting Namibian War of Independence resulted in an influx of refugees and compounded transportation issues. The Benguela railway, which extended west through Angola, was essentially closed to Zambian traffic by the late 1970s. Zambia’s support for anti-apartheid movements such as the African National Congress (ANC) also created security problems as the South African Defence Force struck at dissident targets during external raids.